I was pacing from the counter, to the door, and back - wondering how my new puppy was going to react to me. Will she be all I hoped for? Was I only dreaming about my perfect dog? Will be nothing like that dream? On that rainy September day, I was waiting at the Lufthansa cargo counter at the Houston Intercontinental Airport for my new Russian Spaniel puppy, Belashka Dina. She was coming to live with me and my family from St. Petersburg, Russia. One might ask why I was going through so much trouble to bring to the US a dog that neither AKC nor UKC would even recognize. What was so special about a Russian Spaniel? My personal affair with this breed began when I was eight or nine years old. Picture a group of kids having fun swimming, taking turns diving off of a small pier into a lake on a sunny day, somewhere halfway between Moscow and Leningrad. On that day, my friends brought their Russian Spaniel puppy with them to the lake hoping to introduce her to water. Her name was Dina, and she was five months old. For some reason, Dina absolutely refused to get into the lake. We gave up on her and were enjoying the water ourselves while she sat at the base of the pier. When it was my turn to dive, I ran a few steps and went into the water headfirst, proud of my diving skills. But something went wrong. Instead of performing the perfect dive, I hit my head on the sandy bottom of the lake. I remember it as though it were a movie in slow motion: dive, cool water on my body, hard sand, dull pain, murky water of the lake and everything going black... then sudden sharp pain across my back. As I came up for air, I saw Dina's eyes a foot away looking at me with a great concern. As I swam to the shore and tried to hide my shivering and Dina's paw marks on my back from everyone by wrapping myself in a towel, I watched other kids fuss over Dina for getting into the water. No one but she and I knew what really happened. She probably saved my life down there. As I was trying to peek over the "employees only" sign onto the deck where my new puppy would be brought from the airplane, I was remembering that day. 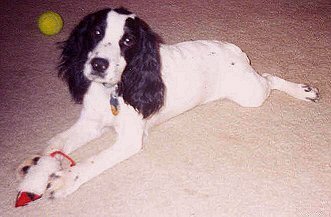 You can imagine how, for the rest of my childhood, I begged my parents to get me a Russian Spaniel. 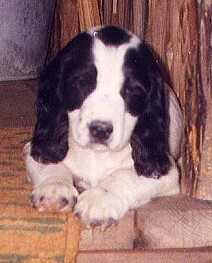 After my family's move to the United States in 1990, my wish to own a Russian Spaniel became little more than a dream. Now, many years later, I made this dream come true. And it was not easy! Since the breed is not recognized in the US, I could not locate a breeder anywhere.